Remember this Thursday, May 3rd is open house here at Kennett Middle School. Bring your parents and show off your school. Open house starts at 7PM and goes to 8:30. The lobby of the building will be turned into an art gallery and this years musical will be showing teasers. Come see what else is going on. We are getting ready for the Schools to Watch Celebration on May 31 and we would like to prepare a video like we did in 2012 and 2015. The song for this year’s video will be “Can’t Stop the Feeling” by Justin Timberlake. On Friday 4/27 and Friday 5/4 we will be around to film students and staff. We need you to show off your best dance moves when you see the camera! There will not be Work Wednesday this week on Wednesday, May 2nd. If you were considering staying, please plan to go home on the bus. We will resume the next week. Thank you. As a reminder, remember to donate money during lunches to help with suicide awareness and buy a yellow awareness ribbon to help as well. We also ask you all to wear yellow on Wednesday May 2nd. Progress reports were pulled. We are in the last term which is T8. Make sure you do your best work and finish this school year with your best effort. 8th Grade students field trip money and permission slips are due by this Friday. Don’t forget!! There will be a Reading Olympics Practice Meeting during 6th grade lunch (11:15-11:47) on Friday April 27th in the library classroom. All participants will meet at this time with their team and compete with the other teams.​ If you cannot attend, please see Mrs. McGarvey or Mrs. Knox. Thank you. Today we are celebrating you. We have our #allin events for 6th, 7th, and 8th grade, during periods, 7, 8, and 9. 6th grade your ticket will tell you where to report for #allin. 7th and 8th grade students you will report to LEAD to find out where you go. Have so much fun! You deserve it! We are in the first half of the 4th marking period, T7. Friday, May 4th is the new progress report date or the end of T7. That is a week from this Friday! THE MEET IS ON the rain will end by noon -You are excused from class after 7th period. Transportation is provided in both directions today from Henderson. Here come a fresh flocab on a friday. ATTENTION ALL ATHLETES & PARENTS! KMS Middle School Students invited! Learn the answers to ALL these questions and more on Tuesday, May 22nd at 7:00 p.m. at Kennett High School in the auditorium. This FREE seminar is a MUST for ALL athletes in grades 7-12 who want to play sports in college, and their parents. A reminder that After-The-Bell started yesterday – Tuesday April 24th. Come join the fun after school. We meet in the cafeteria. Forgot to bring in your After-The-Bell form? Come see Mrs. Kohl in C106. Remember students we have half days today and tomorrow.. We will be hosting parent, teacher, students conferences. See you there! Suicide epidemic is rising tremendously. In 2017, the Lifeline answered over 2 million calls from people across the United States. Suicide is an awful disease that no one should ever have to experience. Each dollar donated, helps to save thousands of lives across the country. Help make a change by donating money at all lunches starting Monday April 23rd until Friday May 18th. Donations can also be given to teachers and the office. Yellow awareness ribbons will also be sold for $1.50 starting Monday as well. In addition to donating we ask you all to wear yellow on Wednesday May 2nd. The softball team beat Chichester yesterday by a score of 14-3. The team totaled 13 hits in the victory and was lead by key hits from Ella Schaub and Aniya Pacheco that drove in 2 runs, Shannon Harvey who went 3 for 3, Amber Kahrs and Genevieve Ebaugh who both hit home runs in the 5th inning, and Abby Adelman who went 2 for 2. Amber Kahrs pitched a great game recording 16 strike outs. The 7th grade baseball team improved to 3-1 after beating Chichester 8-2 on Tuesday afternoon. Ryan King belted his 2ndtriple of the season and Logan Sarosi had 2 hits and Seamus Smith-Walsh did an outstanding job behind the plate throwing out a runner trying to steal in the last inning to help Ben Bolhouse close out the win from the mound. Hat day is this today! If you are wearing a hat please donate $1 to your homeroom teacher. The money raised goes to a cure for Duchenne (do-shen) muscular dystrophy. As well as a hat day, a race is being held at Patton Middle School to again raise money for a cure. If you want to register all you have to do is sign up at Patton tomorrow morning at the race. Run for them so they can run with you. Who is excited for the Phillies game this weekend? The Phillies play the Pirates this Sunday and our very own eighth grade chorus will be singing the National Anthem. Also, we would like to officially announce the teacher that has been selected to throw out the first pitch … Mrs. Keer! Mrs. Keer is warming up her arm and will be throwing the pitch to the Phillie Phanatic! It will be a fun day filled with lots of Kennett PRIDE. Remember when your passing the library to keep your voices quiet. We have students making up PSSA testing and we do not want to distract them. 8th graders taking the science pssa online next week report to the main/middle A wing floor, Monday morning with the same teacher from ELA/Math directly after getting off the bus. Students previously testing with Branham, MacNamara, DiMascola, and Matthews report the library. Lynch and Malkasians testing students report to the bottom floor. PSSA science students make sure to bring your calculators. If you brought your calculator for math testing make sure you bring it on Monday. Remember students we have half days next week on Wednesday and Thursday. We will be hosting parent, teacher, students conferences. See you there! The KMS Book Fair is April 30th through May 4th. Congratulations to the 7th grade girls lacrosse team for their win against Downingtown 14-11. A great job by the team. Goals scored by McKayla Kelly, Lucy Myers, Megan Ward, Britney Sedano and Bridget Wells and Jordyn MacMillan. Nice work girls! Please stay tuned for Flocabulary! Hat day is this Friday! If you want to wear a hat please donate $1 to your homeroom teacher. The money raised goes to a cure for Duchenne (do-shen) muscular dystrophy. As well as a hat day, a race is being held at Patton Middle School to again raise money for a cure. If you want to register all you have to do is sign up at the middle school the morning of Saturday April 21st. Run for them so they can run with you. Attention 8th grade students. Remember to bring in $45.00 and hand it into your 5th period teacher. This is for your field trip on June 11th. Attention 8th grade: Mr. Malkasian is beginning to compile photos for the end-of-year 8th grade video. If you have a few photos that you would like to see included, please see Mr. Malkasian as soon as possible. Attention all students interested in Work Wednesday: Did you know that you do not need to be invited to attend Work Wednesday. Anyone can stay after school from 2:40 until 4:00 in the library for Work Wednesday. You can ride the After The Bell bus home after Work Wednesday if you register for After The Bell and choose a 2nd session. Work Wednesday will be your first session. If this interests you, just complete an After The Bell Registration packet and indicate that you will be going to Work Wednesday for your first session. See Mr. Moore with questions. Please stay tuned for a student of the month video. A reminder – After-The-Bell registration forms are due today so turn them in to Mrs. Kohl in C106. Tomorrow – you will get your Activity Confirmation letters in homeroom to bring home. After-The-Bell starts next week for Tuesday activities and the following week for Wednesday and Thursdays activities. Questions – see Mrs. Kohl in C106. The boys lacrosse team defeated Stetson 8-7. Goals were scored by Jake Freeberry, Shane Hanrahan, and Brady Mitchell. PSSA Math starts this Monday, April 16, 2018! On Monday morning when you get to school, please report directly to the testing location where you took the PSSA English Language Arts. Remember to get a good night’s sleep on Sunday night and eat breakfast on Monday morning. If you own your own graphing calculator, please remember to bring it to school with you on Monday morning and make sure it is charged or has batteries. There are no morning announcements next week and we will begin testing promptly at 8:00am. We will test on Monday and Tuesday in the morning and have a modified schedule in the afternoon. It is very important that you arrive to school on time. You are allowed to bring healthy snacks, mints, gum, and water to your testing location. We will serve breakfast in the cafeteria on testing days. On Monday morning, your test administrator will reread the Code of Conduct for Test Takers and the Electronic Device Letter. It is very important that you do not have a cell phone, iPod, iPad, Apple watch, etc. in the testing room. Remember to bring a book to read after you finish your test. 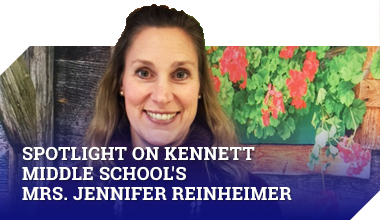 We are so excited to see how much you have learned this year and we know that you will show your best Kennett PRIDE and academic excellence! Any student or staff member who purchased Phillies tickets please come to the main office to pick up your tickets now! Sign up forms for After-The-Bell Spring activities are due this week. Activities are filling up quickly, so get your forms in soon. Come join the fun. We have everything from Soccer to Robotics, Ponies, Fun with Nature, Learn to Fly an Airplane, Pickleball at the YMCA, Painting and much more! It is free, and you can even get a bus ride home. Madagascar students can join after the musical for last 4 weeks – so get your forms in this week. The softball team beat Pierce yesterday 6-2. The game got off to an exciting start with Amber Kahrs smoking the first pitch to deep left for a home run. She finished the day 3 for 3 with 4 RBIs. Genevieve Ebaugh pitched a complete game and racked up 16 K’s. Abby Adelman, Ella Schaub, Meredith Day, and Shannon Harvey all had timely hits to help power the offense.The 7th grade baseball team won the first ever game on the new KMS Field Friday afternoon 5-2 over Octorara. The Blue Demons had outstanding pitching with 2 shutout innings apiece from Brennan Smith and Chris Murphy and only 1 run allowed each by Bailey Shindle and Ben Bolhouse. In total, Kennett hurlers struck out 9 and only allowed 4 hits. The offense was led by Jack Bowdoin with 2 runs scored. For the Kennett girls Arden Seele won the Long Jump and others who placed in the top 2 in their events were Kim Alvarez (200), Kylie Winterling (DIscus) and Ella Burnham in the mile. Do not forget today is picture day and we stay at Kennett Middle School. Pick up is 4:30 at KMS. Attention Girls Lacrosse Players, team pictures will be at 3:30 today. There will be no practice after pictures. Congrats to the 7th grade girls lacrosse team for their win against Pierce yesterday. Well played by the whole team. The final score was 12-2. Kennett goals by Mikayla Kelly, Megan Ward, Lucy Myers, Britney Sedano, Jordyn MacMillan and Bridget Wells. Go Kennett Lax! Wow, you did it! ELA PSSAs are done for most of you. You should be proud of yourselves for working so hard. We have a few days to get ready for Math PSSAs which start on Monday. The 7th grade baseball team won the first ever game on the new KMS Field Friday afternoon 5-2 over Octorara. The Blue Demons had outstanding pitching with 2 shutout innings apiece from Brennan Smith and Chris Murphy and only 1 run allowed each by Bailey Shindle and Ben Bolhouse. In total, Kennett hurlers struck out 9 and only allowed 4 hits. The offense was led by Jack Bowdoin with 2 runs scored. The 7th grade boys then moved to 2-0 with an 11-3 win over Stetson on Tuesday afternoon. The strong offensive attack was paced by 2 hits each from Adrian Shevchuk, Drew Zieg, and Brennan Smith. The softball team is off to a great start winning its first two games of the season. They beat Octorara 15-2 last Friday. Genevieve Ebaugh pitched a no hitter and the bats were alive connecting for 15 hits. Amber Kahrs and Shannon Harvey each had 3 hits. Maddie Sears, Grace Baliff, and Genevieve Ebaugh each had 2 hits. Yesterday they beat Stetson 11-0 and 2 pitchers combined for another no hitter. Amber Kahrs lead the way with 3 hits and Ella Schaub, Shannon Harvey and both had big hits. Genevieve hit her second home run of the season.